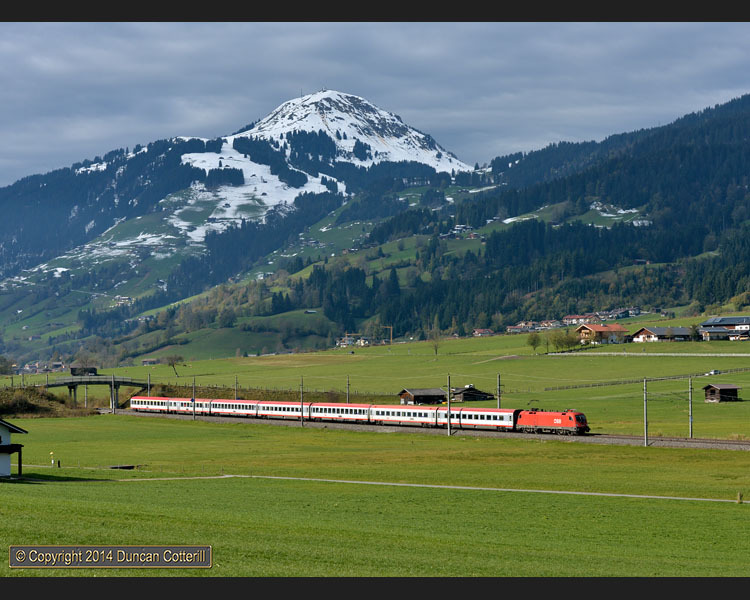 1144.088 led IC515, the 08:24 from Innsbruck to Graz, around the horseshoe curve at Unterwindau on 30 October. The 1829m peak of Hohe Salve dominates the broad saddle between Brixen and Kirchberg, one of the line’s secondary summits. 1116.282 headed east with IC865, one of the few remaining Bregenz - Wien trains not worked by a RailJet set, on 30 October. The timings of diverted and normal services often clashed and good use was made of the bi-directional signalling to allow overtaking. Wien bound RJ663 was close to catching up the preceding EMU as it approached Kirchberg, bang road, on 31 October. Locos were 1116.232 on the front and mid-train 1116.200. MAV’s 470.001 worked a short westbound freight towards Brixen on 31 October, paying back ÖBB for km Austrian locos work on Hungarian metals. It was a very pleasant surprise to find a class 1142 in the classic orange/red colours working Salzburg - Wörgl locals. 1142.682 headed west near Brixen with REX1504 on 31 October. The mountain behind is the 1996m Kitzbüheler Horn. Most local services are worked by these class 4024 articulated 4-section EMUs. 4024.022 is seen here accelerating away from Kirchberg with REX5022, the 11:12 from Schwarzach-St.Veit to Wörgl, on 31 October. 1016.021 worked EC163 or EC164 every day during my visit. 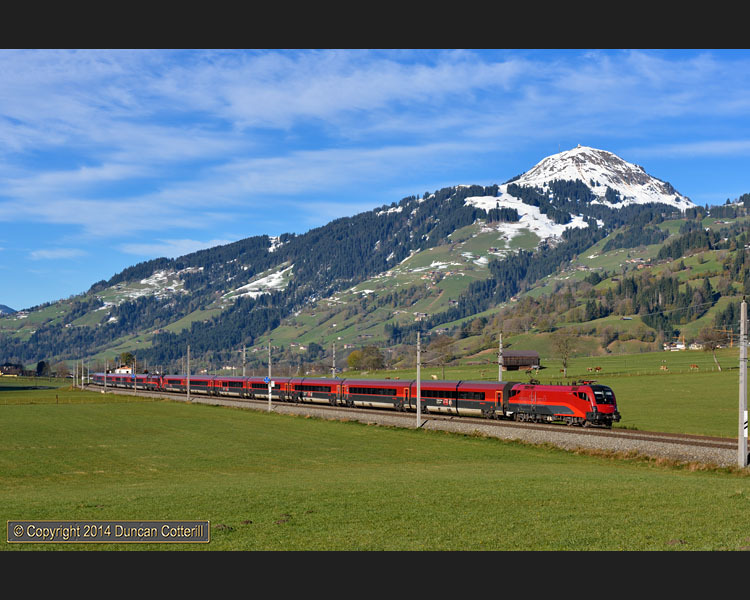 It’s seen here near Pfaffenschwendt, with the 2634m Birnhorn behind, while working EC164, the 09:45 Graz - Zürich, on 31 October. 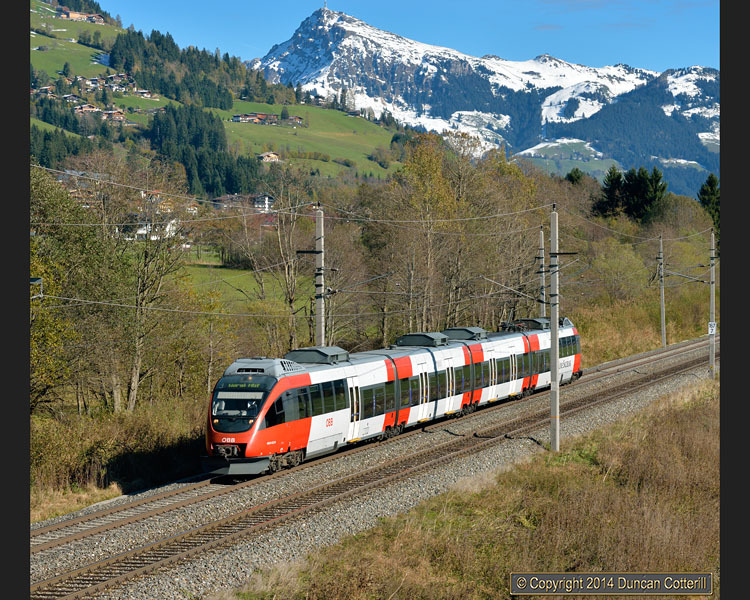 There’s a regular turn for a MAV class 470 on REX services between Salzburg and Wörgl and 470.007 was captured approaching Pfaffenschwendt with REX1508 on 31 October. I wonder where they got the idea for the livery? 1144.042 and 1116.161 eased a heavy freight down the bank from Hochfilzen towards Pfaffenschwendt on 31 October. Rail Cargo Hungaria liveried 1116.041 brought up the rear of RJ160/560, the 07:30 Wien Westbf - Zürich HB / Bregenz, seen west of Fieberbrunn on 1 November with the peaks of the Wilder Kaiser behind. 1016.021 again, this time passing the magnesite works at Hochfilzen, with EC163, the daily Zürich - Graz EuroCity service, on 1 November. Note the single SBB coach at the head of the train, a rarity in Austria. 1144.040 propelled REX1511, the 13:38 Wörgl - Salzburg semi-fast over the summit of the Grießenpass, east of Hochfilzen, as the shadows lengthened on 1 November. Temporary closures of the Traunstein - Salzburg line, followed shortly afterwards by the Rosenheim - Kufstein line, led ÖBB to divert trains that normally run via the German “Korridor” from Salzburg to Wörgl for more than a week at the end of October 2014. The diversions followed an all-Austrian route from Salzburg to Wörgl via Schwarzach St. Veit. 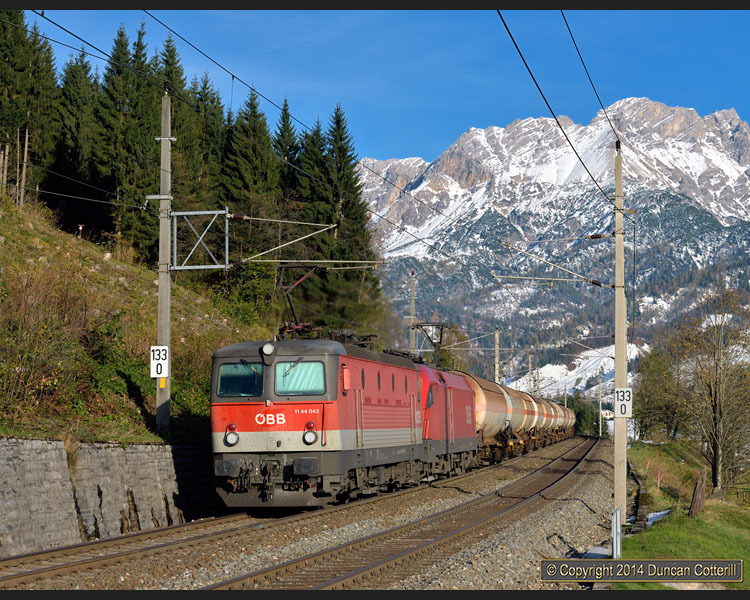 After spending four days in Germany photographing ECs diverted from München to Salzburg via Mühldorf (report here), I crossed the border to spend three days covering the diversions on the Wörgl to Schwarzach line, from Thursday 30 October to Saturday 1 November 2014. The line, sometimes called the Giselabahn, runs through glorious Alpine scenery serving places normally associated with top class winter sports, such as Kitzbühel, Fieberbrunn and Saalfelden, and reaches a summit of just under 1000m above sea level at the Grießenpass, a couple of km east of Hochfilzen. It's double track throughout, electrified at 15kV and includes gradients as steep as 2.6% or 1 in 38. The line normally sees a number of loco hauled regional passenger services, mostly booked for class 1144 electrics attached to the west end of single-deck push-pull sets. A MAV class 470 is booked to cover one of the regional turns, also with a push-pull set, adding a bit of variety. One of the 1144 diagrams was worked by an 1142 on the Thursday and Friday, adding more interest. The stock for another Thursday working didn't have a driving trailer so had to be hauled eastwards as well as westwards. The majority of regional services were covered by class 4024 EMUs during the week, with one of the units making an unwelcome appearance on the Thursday on a train that should have been loco and push-pull set. Locos 1142.682, 1144.015, 040, 043, 077 and 470.001, 003, 007 were seen on regional services. 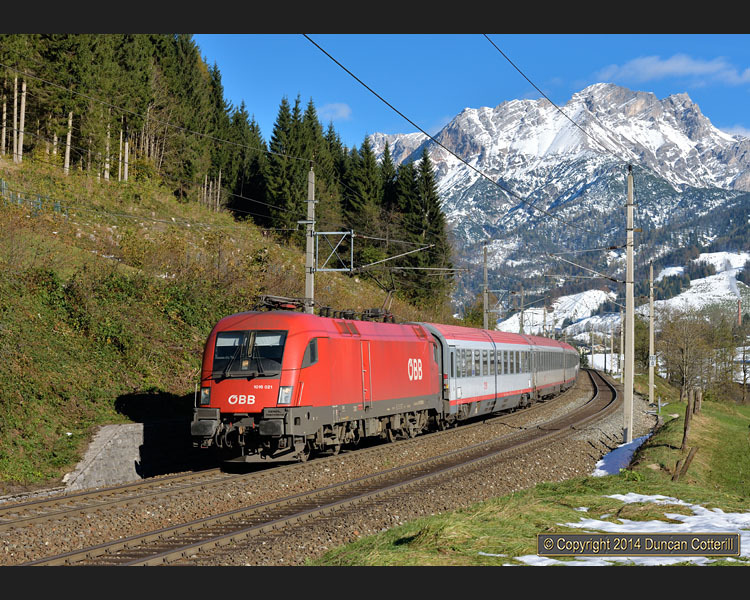 Long distance passenger services are usually limited to a couple of trains each way a day between Innsbruck and Graz. One pair was extended to start from Zürich this year and they now run as ECs. The Zürich trains were long rakes of around 11 coaches hauled by a class 1016 or 1116 loco. 1016.021 seemed to be a favorite and worked one or other train each day. Other locos seen were 1016.016 and 1116.165. The morning Innsbruck - Graz was worked by an 1144 on a three-coach set of IC stock with a regional driving trailer at the rear. I didn't see the return working so can't confirm whether it was pushed or not. Locos 1144.013 and 1144.088 were seen. 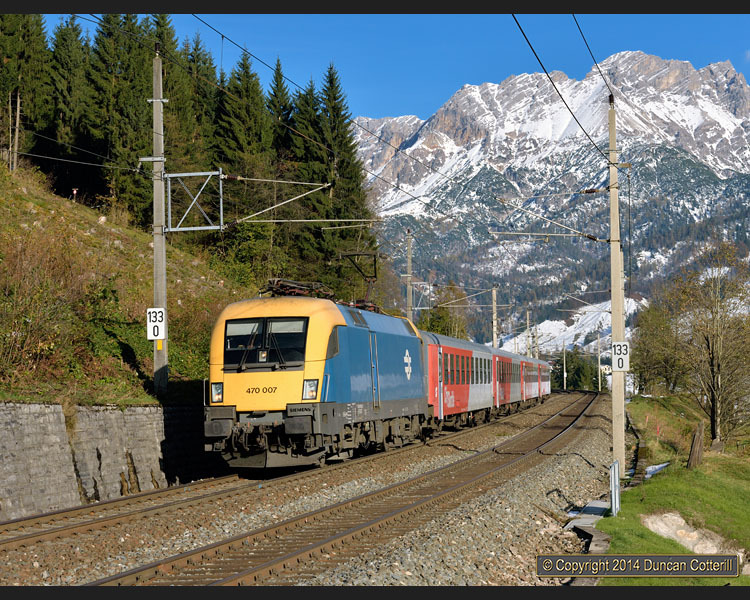 There is also a Saturdays and Sundays only IC service from Wien to Innsbruck, normally routed via Schwarzach, which was seen on the Saturday with 1144.043 on the front. During my visit the trains noted above were supplemented by hourly RailJet or InterCity services diverted from the Salzburg - Rosenheim - Kufstein "Korridor". The InterCity trains were hauled by red class 1016 or 1116 locos on conventional stock with locos 1016.012, 041, 1116.112, 127, 192 and 282 all seen. The Railjets were worked by class 1116 electrics at the east end of dedicated push-pull sets. Normally RailJets seen in the Tirol have the loco at the west end but the diversions required a reversal at Salzburg so they were the other way round for a few days. All but one of the locos working RailJets were in RailJet livery although many were the wrong way round, with the red end coupled to the coaches instead of the grey end. The very welcome exception to the RailJet loco monopoly was the use of Rail Cargo Hungaria liveried 1116.041 on RJ160 (Wien - Zürich) on the Saturday. A significant number of trains were formed of two RailJet sets coupled together with a loco in the middle and another at the front or back, depending on which way the train was going. Apart from the rogue RCH loco, 1116.200, 201, 203, 205, 211, 216, 218, 220, 224, 232, 233, 235, 237, 239, 240, 241, 244, 245, 248 were all seen on RJ services. Freight services didn't seem any more frequent than I would have expected normally, indicating that most freight between the Tirol and the rest of Austria is probably routed this way anyway. Five freights were seen in six hours on the Thursday and nine freights in seven hours on the Friday but none at all on the Saturday. Motive power for most freights was a pair of class 1016, 1116, 1144 or a combination of these classes. When a freight was worked by an 1144 and a Taurus, the 1144 always led, a practice I can only approve of. A handful of short freights were single headed, one by a MAV class 470, going west on the Friday morning and returning east in tandem with an 1116 at lunchtime. One Thursday morning westbound had a class 1063 attached to the back and another 1063 worked a handful of oil tanks west on the Friday morning. Locos seen were 1016.010, 027, 033, 043, 1116.055, 066, 090, 121, 123, 148, 150, 161, 1144.042, 098, 125, 126, 250, 1063.047, 049 and 470.001. A single diesel was seen, 2016.041 went east with a breakdown train coach on the Thursday morning. After four days of predominantly gloomy weather in the Mühldorf area, Austria was a very pleasant change with good light around 70% of the time. There was even some early snow around Hochfilzen. The mix of trains was interesting but with regional services having the loco at the west end and RailJets at the east end, it was sometimes seemed that every train was being pushed. Many of the best pictures were of the diverted InterCity trains, combining a red loco with a rake of coaches long enough to fit the big scenic locations on offer. It’s unfortunate that these classic trains seem to be on the way out, replaced by yet more RailJets. Since the line was re-electrified, in the early ‘90s I think, pole spacing has been less than ideal, making it difficult to get pictures without a pole growing out of the top of the loco. It’s not just the relatively short spans that are a problem, the poles appear to be closer to the track than in Germany and they’re staggered as well, minimising the available gaps. The fact that the Taurus design is a good 3m longer than an 1142 or 1144 doesn’t help either. I flew from Heathrow to München with BA and picked up a hire car at the airport, using it to travel around in both Germany and Austria. Accommodation for the three days on the Giselabahn was at the excellent Pension Sonnwend in Westendorf but quite a long way from the station, which is in the neighbouring village of Moosen. Overall, the three days in Austria were very enjoyable with more motive power variety than I’d expected, clear light, excellent scenery and enough good locations to keep any photographer occupied. I did have to accept that there would sometimes have to be poles in places I didn’t want them though, but you can’t have everything. 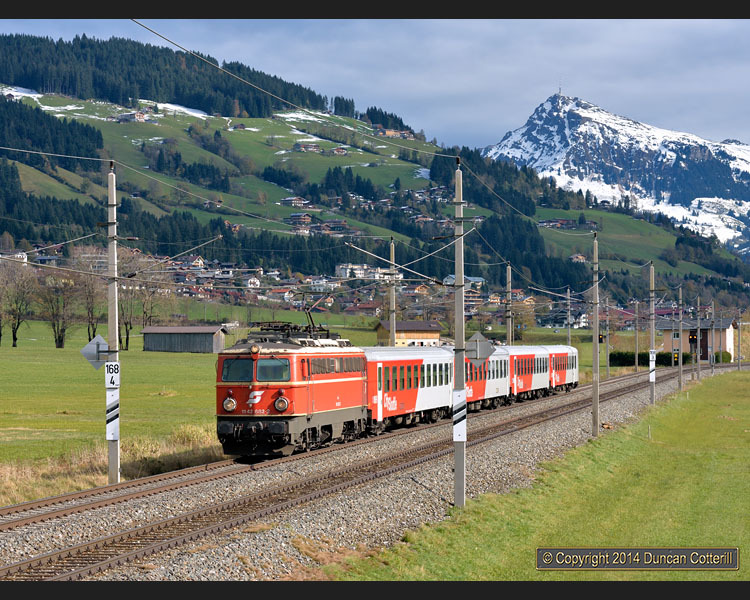 I’d largely stayed away from Austria in recent years due to suffering from Taurus fatigue after spending a day on the busy main line east of Salzburg in 2010 and seeing nothing but varieties of Taurus. This trip re-ignited the flame to some extent, making me want to go back for more, particularly if I can work some of the remaining 1142 and 1144 worked trains into the mix. Although I used a hire car to get around, it wasn't that much of an advantage in Austria. Like Switzerland, it's often difficult to find anywhere to park that's remotely near the photspots. None of the locations I visited was more than 3km from the nearest station and most were a lot closer. During the week it would be entirely possible to do the line by train but the local service gets very sparse at weekends, making it more difficult. Thanks as always to the diagram compilers, without whose efforts it would be far more difficult to be in the right place at the right time.